David Soo began working in clay in 1971 at age 9, and was introduced to Anagama wood firing in 1989. Education in a Summerhill-style school produced an inherent non-conformity in the way he views the creative process. This perspective, paired with influences from his Asian and European heritages, has developed David’s work into a synthesis of Abstract Expressionist Art and pottery. 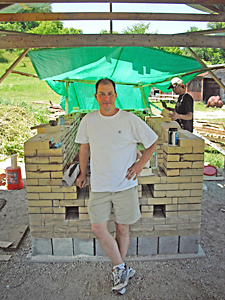 The co-builder of his Anagama kiln, David has had the opportunity to study with respected artists such as Peter Voulkos, James Makins, Lester Polakov, and Peter Leventhal. He has exhibited in museums and received a New Jersey Council for the Arts Fellowship for outstanding excellence in ceramic art.